Amid the crisis, the price of any product and service are increasing; meanwhile, your salary is not increasing. We should thrift some expense to avoid from bankrupt. One of our expenses is food cost. Some people tend to spend much money for it. Food is essential for our body and we will die if we are not eat it. It is impossible to delete the food cost in our life.Therefore, you should thrift food cost. There are some ways to reduce the food costs. 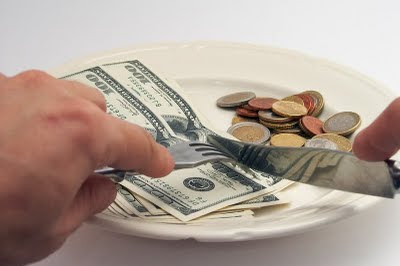 Eating in house thrift your money and make your body health. Eating in house does not need to go out with your car which need gasoline so you will cut gasoline expenses too. Eating in house will not be charged with tax too. Cooking in your house will thrift some buck because you do not need pay the service of a chef. Cook any food that safe for your health. For Example, avoid sugar If you suffers diabetics or reduce salt if you suffers hypertensive. Buying food at groceries could cut some money. Get some groceries coupon to buy the product. 4. Bring lunch box to your office. I often bring lunch box from my house and eat it at my office. My office provides table for it. 5. Buy the food in bulk. Some shop or groceries give discount if you buy in bulk. As long your refrigerator works well, you can storage your food at it. 6. Plant some vegetables or fruit at your backyard. When the fruit or vegetable is ripe, you can use it for your food. Beside as the food source, the plant make your house green. Great posts! Really interesting to many readers. I really appreciate your work! keep it up. I'd like to request you for link back -----if possible. happy new year in advance to all friends here. Cooking in your house will some buck because you do not need pay the service of a chef.Cook any food that safe for your health!!!!!!!!!!! Food is essential for our body and we will die if we are not eat it. It is impossible to delete the food cost in our life.